Property Location SF Suites is in the heart of Buenos Aires, walking distance from Plaza Libertad and Teatro Nacional Cervantes. 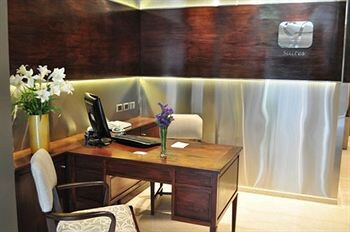 This aparthotel is close to Teatro Colon and Obelisco.Rooms Make yourself at home in one of the 25 air-conditioned rooms featuring LCD televisions. Your room comes with a pillowtop bed. Rooms have private balconies. Complimentary wired and wireless Internet access keeps you connected, and cable programming provides entertainment. Bathrooms have complimentary toiletries and bidets.Rec, Spa, Premium Amenities Make use of convenient amenities, which include complimentary wireless Internet access and tour/ticket assistance.Business, Other Amenities Featured amenities include complimentary high-speed (wired) Internet access, dry cleaning/laundry services, and a 24-hour front desk. A roundtrip airport shuttle is provided for a surcharge (available on request).